Okay, so we’re gonna have two more weeks of G1 dominance, and at this point, it’s inevitable. As you can see from this week, the Honorable Mentions have a nice mixture, including a match from World Of Sports’ return to TV. For a first episode, it showcased a few wrinkles, villains and babyfaces to get behind, while giving us at least one top quality match. Last week’s voting was fairly competitive, but the number 1 match actually ran away with the vote by the final tally. So that means, G1 Climax 28 Hirooki Goto vs Tomohiro Ishii, is moving into the July pool. Also this will be the final week in the July voting pool, but at least we have a non-New Japan match that might take this week. Without further ado, let’s just see what matches made the Top 5 this week. These two men met up last year, and Omega moved passed him without much challenge. This year SANADA is in a position to not only help himself, but help his LIJ leader Tetsuya Naito, if he can put a blemish on Omega’s record. Well SANADA was the overall favorite and played babyface in the match. Early on he knocks Omega to the outside, and Omega moves out of the way anticipating a Tope, but SANADA catches himself and holds the ropes open for Omega. Kenny never takes his eyes off SANADA, but SANADA allows him to get in. The crowd cheers, SANADA claps for good sportsmanship and as he tries to get in, Kenny dropkicks his knee. That ends up playing a big part in the match, since many of Omega’s strikes aim for the injured knee, where a lot of SANADA’s offense needs his legs. Eventually we see Omega slip up and SANADA puts a few moments together, fighting through the pain to land a few dropkicks and a Plancha to the outside. At this point it seems a little more even, but a big highlight spot is when SANADA gets shot into the corner, does the Flair/Misawa up and over, then attempts a Springboard Dropkick only to get caught into a Powerbomb. I think Omega did something similar in one of his Okada matches, but the spot is still cool. From there we see both men trading strikes, playing to the crowd and trying to get small advantages. SANADA is only ever really able to get Skull End once, but let’s go to attempt his Moonsault, but misses that. SANADA however has kind of turned into a greatest hits of AJPW with his moveset. Mutoh Moonsault, Misawa up and over with the ropes and even pulling off a few Tiger Suplexes. Even though we did see a lot more from SANADA this year, the match went the way most predicted. Omega and SANADA jocky for position, counter a few moves, until Omega gets him mostly set for the One Winged Angel, and good night SANADA. Omega moves to a perfect 10 points, and SANADA is still positioned okay with 6, but someone has to figure out how to slow down the champion. Surprised this is the main event, but I am very glad this is the case, since I don’t think the two have faced each other before. Adding a special aspect to this match, despite it happening in the G1 Climax. Both of them have two victories and one loss and a victory for either one of these men would give them a bigger advantage since neither of them has fought Kenny yet and they could be the ones to knock Omega down a peg. Who’s gonna get the win? Either way, we’re gonna have something special in this dream match between two. SANADA really is something special and the more I watch him more frequently in these types of matches, the more I slowly start to consider him my favorites in 2018 overall and not just in New Japan. It was pretty much exactly how I expected it to turn out with while having a great match, still leaving out enough to let us know that they could definitely fight again pretty soon and I’m sure they’ll blow us away the next time their paths cross. Majority of the match was fairly even with the chain wrestling, the reversals, and the attempts of hitting their big moves onto each other but some of the spots however would come out a tiny bit sloppy, but not enough to take it away from the match at all. SANADA goes to the outside where Ibushi attempts a Baseball Slide for SANADA to duck it and drag him outside also and eventually Ibushi jumps to the ropes to land an Asai Moonsault. Ibushi now pulling the big spots with the Last Ride only for SANADA to kick out at two and SANADA kept on weakening Ibushi with the Skull End a few times to try and get him down for the Moonsault and Ibushi rolls out of the way before it would connect. Ibushi looks to finish it with the Kamigoye Knee and SANADA ducks the knee to get him into the Skull End one more time and even gets him knocked out long enough to drag him to the corner for the Diving Moonsault as SANADA gets the win. I felt like SANADA winning the the Skull End here would’ve been a more impactful finish, but I will take this and glad to see SANADA getting the victory over Ibushi, but I would love to see them fight again and soon. Both men are in the middle of the block, and have a little bit of history. 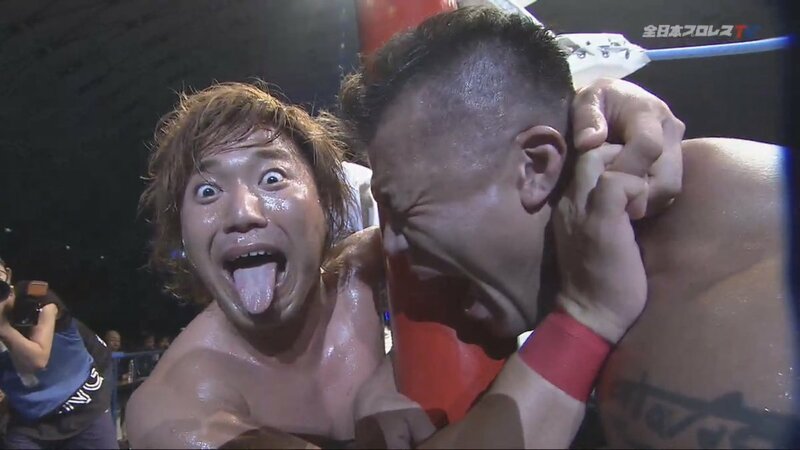 Ishii has been the MVP of the tournament so far, but we all know what Ibushi is capable of. So let’s see how this one plays out. Girl damn. The start off driving into each other with Shoulder Tackles, and then we see a flurry of counters and misses that end in the good ole fashioned stare down. From there we go to Ishii being in control as he keeps baiting Ibushi to hit him harder, hit him for real, and just keeps sending Kota backwards with Forearm Strikes. The first few minutes were almost as brutal as the Ishii vs Goto match. The Kota takes it into the crowd and does one of his signature second story/balcony Moonsaults onto Ishii as the crowd was in full throat with the Yes chant. From there Ibushi seems to almost channel his inner Shinsuke Nakamura. When they get back in, Ibushi starts with short kicks and slaps to Ishii’s head to insult him into squaring up. That goes on a few times, and both men trade ‘big brother’ kind of moments. Kota hits his Last Ride Powerbomb while falling backwards a little so he just sits out, for a near fall. His first KamiGoye attempt is countered, as Ishii hits his own. Then when Ishii tries the Vertical Drop Brainbuster, Ibushi counters it with one of his own. After both men steal a finisher, then we go back to strikes. Headbutts from Ishii rock Kota. Ibushi’s kicks glaze over Tomohiro’s eyes. The punishment was on full display as Kota hits a Sliding Knee for only a 1 count. At that point there’s a few more strikes until Ibushi grabs Ishii’s wrist, kicks him in the top of his head, which sends him down to his knees, and Ibushi takes the opening to land KamiGoye. This match will be towards the top of most people’s lists in the G1. We’ve still got 9 more nights if you include the Finals, but this was tremendous. Zeus has been on the rise for about a year now. After a decent showing in the 2017 Champion Carnival with a win over Joe Doering, he was granted a title shot during the January 2nd New Years Wars show, but fell short. From there we see Zeus slowly move away from being a tag team wrestler, especially off the heels of the 2018 Champion Carnival where he had an opportunity to win B Block, but fell short there also. Miyahara is seen as the new Ace of All Japan. Young, extremely charismatic, over with every crowd and very adept in the ring. After going back and forth in tag matches, Zeus was positioned well enough to grant him this opportunity. Does 6 more months of seasoning, give him what he needs? So what we get here is a match with two men who are very familiar with the other. The early action is slow and methodical, where both trade back and forth until Miyahara takes it to the outside. Kento decided to play heel, since this final show of the Summer Action Series, was in Zeus’ hometown of Osaka. So we see Kento using the barricades, working at Zeus’ legs and turning up the aggression. Even going as far to do a signature spot of his where he pulls his opponents head against the ring post and doesn’t relent even after the referee gives the 5 count. This time, referee Kyohei Wada was pulling on Miyahara’s hair and yelling at him, all while he continued to pull on Zeus’ head. This made for a small comedic wrinkle with Wada admonishing him like an angry father, but the match went on. Kento maintained the advantage in a lot of this match. As soon as Zeus started to build some momentum with Lariats and power moves, they go out to the apron, where Kento snaps off a big Vertical Suplex, which may have given Zeus a stinger since he was favoring his left arm and wiggling his fingers, causing the referee to come out and double check on a couple occasions. Zeus is about to beat the 10 ten count (it’s at 7) but he loses grip of the ropes and falls back to the floor. Wada is about to count 10 but Zeus is mostly on the apron, and Kyohei uses his discretion to stop his count. But it was here that we basically got a different match. Kento flies into the corner to connect with a Blackout, only to piss off Zeus and have him storm out of the corner with a massive lariat. Both men trade signatures for a while here. A few more Blackouts (V-Trigger Knees) and a German Suplex Hold from Kento, while Zeus connects with a Chokeslam and even a Jackhammer, but Kento kicks out. I’ve never seen someone kick out of the Jackhammer, or it happens so rarely it felt new to me. So the suspense builds nicely as Miyahara keeps trying to land his Shutdown Suplex, but Zeus is a former bodybuilder, so trying to keep his arms down is asking a lot. After each failed attempt, both men trade strikes until it looks like Miyahara finally has it. But midway throw Kento’s arch for the bridge, Zeus breaks out and sends the Ace spinning with a lariat. One more Jackhammer, and we have it, a New Triple Crown Champion! After feeling he’s dispatched Johnny Gargano, Ciampa decided to focus his attentions on the NXT champion. 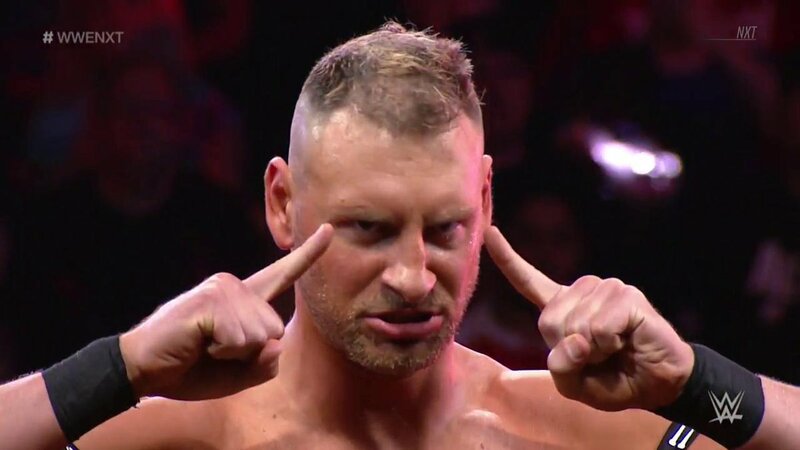 Neither one of them having a lot of back story together, made a lot of sense to give us a couple weeks of Ciampa stirring the pot and then we get a TV title defense. The frustration was obvious in Aleister’s aggression, moments of chiding Tommaso and even things he said throughout the match. Early on it’s very back and forth, we see more mat wrestling than one might expect and not a lot of strikes. The early going showcased Ciampa’s mind games mainly, especially when he stops short as Black attempts a Deep Arm Drag but misses completely, giving Ciampa a pin attempt for 2. Eventually Aleister turns the tide and Ciampa is on the back foot for a bit. It spills to the outside and Black continues to throw Ciampa around and land some big Round Kicks, as they slide back in Ciampa jumps on the champion quickly to try and build back his position in the match. But the educated feet of Black get the best of Ciampa again, so when Ciampa gets knocked off the apron, it looks like Black will go for a dive, but Ciampa moves, Aleister does his Asai Moonsault into a meditative sitting position and waves at a now annoyed Tommaso Ciampa. After heading back into the ring, Ciampa finds a small opening to push Black over the top rope in mid Moonsault. This grants the opportunity for Ciampa to throw him into the barricade, apron and then the stairs. Ciampa returns the mind games but sitting on the stairs cross legged and waving. It’s at this point the intensity of the match picks up and it becomes a very back and forth effort. Ciampa has a small advantage, then a timely kick or suplex grants Aleister the opening he needs. Out of desperation we see Ciampa uses a crutch from under the ring while the ref isn’t paying attention but only gets a 2 count. Then Ciampa goes to the outside and pulls up the protective mat, which prompts the referee to come out and scold him. So when Ciampa heads back in the ring, Black charges him and accidentally kicks the referee off of the apron, immediately after landing Black Mass, but with no one to count. Black goes to try and revive the ref, when he returns to the ring and lifts Ciampa, Tommaso drives his thumb into Black’s eye. 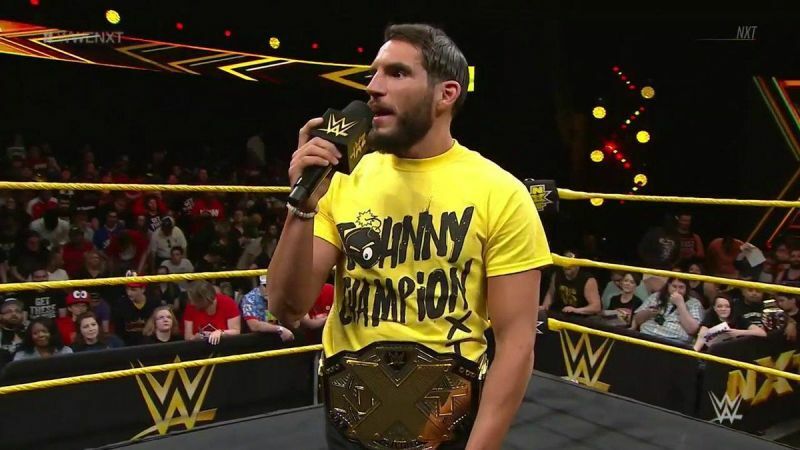 Taking the moment he goes to get the NXT Championship to use it as a weapon, but Johnny Gargano tries to get involved. Superkicks Ciampa and in the process of grabbing the belt away, he loses his balance and strikes Aleister with the belt. Ciampa throws out Gargano, the ref slowly makes it back into the ring and Ciampa nails a Double Underhook Piledriver for the victory. Most of the callbacks in this match were callbacks to his matches with Gargano, so it made sense for him to get involved. This is most likely heading towards a Triple Threat, but for now, we have one of the best heels in the business walking away with the gold. Well, this is one of those week’s I go with the dark horse match. Zeus has been one of my favorites since I got back into All Japan last year, so seeing the payoff in a high quality match, and his way of walking around the entire stage area to personally shake hands and hug each fan, was something special. Yes yes, Ciampa being the devious evil villain is a good story, but it’s also an outcome most of us knew was happening since WWE spoiled it themselves. So for shear impact it had on me, and a little smidgen of bias, I’m going with, AJPW Triple Crown Championship: Kento Miyahara vs Zeus, just because. 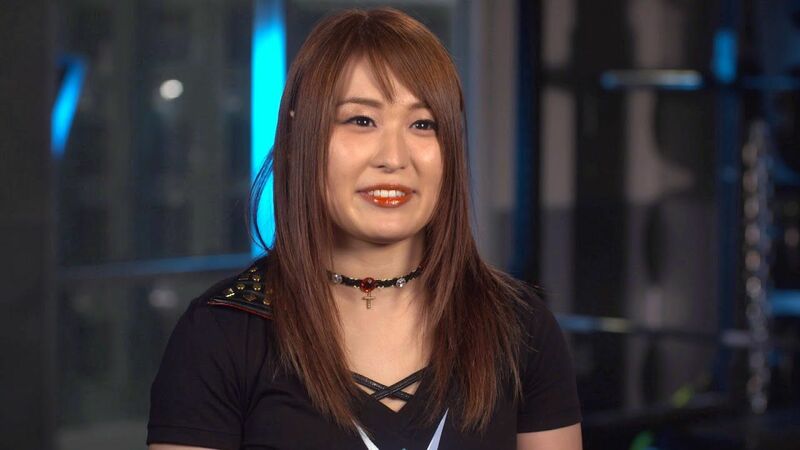 What Will WWE Do To Revitalize Asuka As A Title Contender?